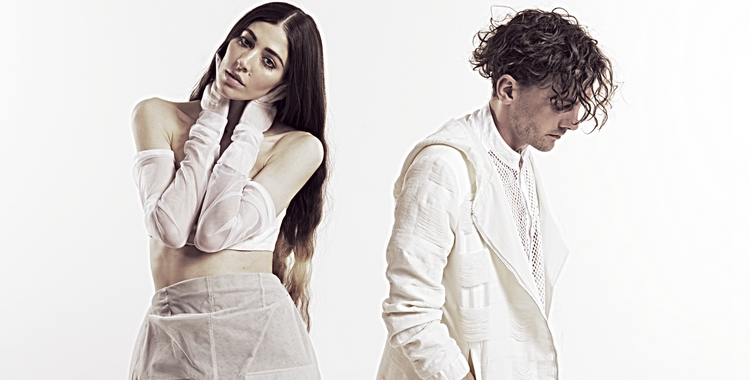 Synthpop duo Chairlift brought their new album Moth to life in London last night, to a full house of straight couples and single attractive gay guys (according to Grindr, that is). Wearing a ladder rope casually layered over a red crop top, paired with crocodile print pants and a Lara Croft ponytail, Caroline Polachek belted out all but one of the bops from Moth with (almost) pitch perfect vocals. She effortlessly slayed that high note in “Show U Off”, and went on to reach some stellar Mariah-level notes in new song “Get Real”. ​Working the mic like a pro, Polachek used it to create a manual pan effect of her vocals in “Look Up” and demonstrated a mastering of the DivaDistance (the act of holding a mic close enough so that the audience can hear big belted notes without feeling attacked by them) during “Unfinished Business” in particular. Both her and bandmate Patrick Wimberly exuded talent, allowing their fingers to dance over keyboards, guitars and drums to churn out the tunes Chairlift fans the world over know and love. Unfortunately their first album was shunned, except for the Chairlift staple track “Bruises” which had even the non-movers moving, and second album Something was barely recognised. A shame really, considering the massive excitement from the crowd upon hearing the opening notes of “Amanaemonesia”. No comment on the disappointing rework of the band’s classic bop (and my personal fave) “I Belong In Your Arms”. All in all, a fabulous demonstration of the duo’s musicianship. Polachek’s introspective comments about previous performances (“I have very clear memories of playing [‘Bruises’] in London in 2008”) solidify the fact that this is a group who simply love music, and just want to create and share it with people who will listen. Based on the crowd’s rapturous response to pretty much every sound the band played, they shouldn’t have any problems finding people to share their music with for a very long time.